Ultimate duo - Justin Timberlake and Jay-Z are set to headline at this years Wireless Festival in London. This year the annual festival will be held at the new Queen Elizabeth Olympic Park, with a craaaazy and exciting line-up including Frank Ocean, Kendrick Lamar, Miguel and much more (full line up below). Emeli Sande and Rita Ora are the only UK artists that are set to perform at the UK festival - which is quite a damn shame for a show being held on British soil. Anyway's check out the full line-up for the show that will be held over two days. 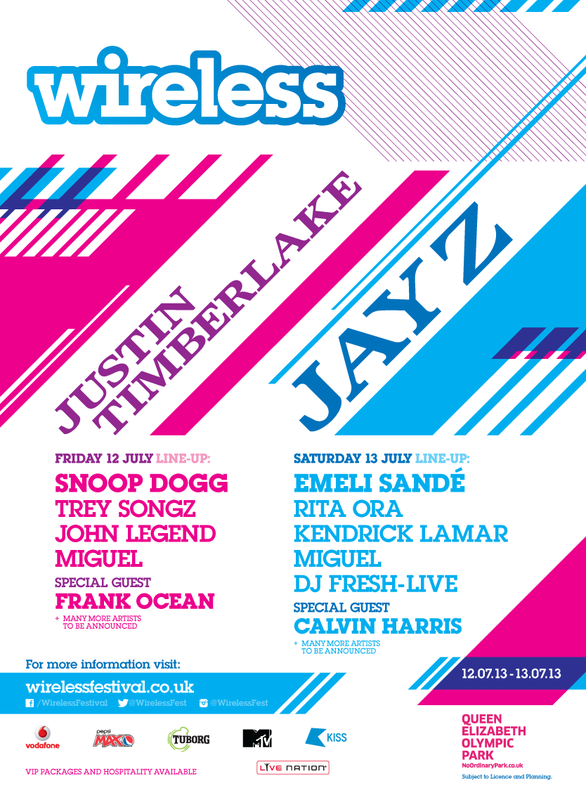 Tickets for Wireless Festival will go on sale on Friday, February 22 HERE!! MANY MORE ARTISTS WILL BE ANNOUNCED SOON - HOPEFULLY SOME UK ARTISTS WILL BE ADDED! !